I'm actually really super excited about these new collections. Finally, something I can't wait to post! Why am I so excited about this stuff? One word. Hopefully I'll get good enough lighting to swatch these soon, but for now, how about some bottle pics?? 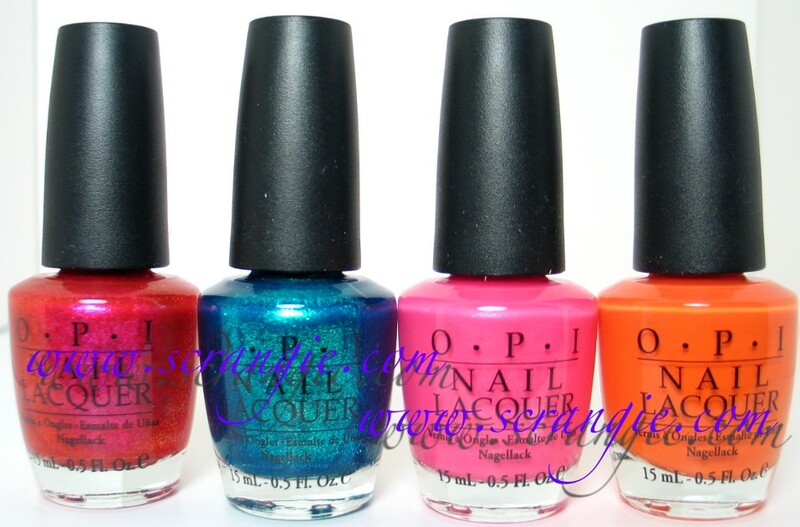 OPI's Summer Flutter 2010 collection. Wing It! (weird duochromey murky shimmery pink), Catch Me In Your Net (glittery blue-green duochrome shimmer, looks just like Zoya Charla), Flower to Flower (bright candy pink with gold shimmer), Flit a Bit (orange creme). China Glaze Vintage Vixen! These seem right up my alley. Dark and full of microglitter. China Glaze keeps calling them frosts, but they don't look all that frosty to me- a few of them look like foils! I haven't tried them on to be sure, but I don't think they're frosty ick like we've been dreading. Classic Camel, Ingrid, Swing Baby, Goin' My Way?, Foxy, Riveter Rouge. Hey Doll, Bogie, First Class Ticket (which is dark purple, not blue), Midnight Mission, Emerald Fitzgerald, Jitterbug. Oh yeah, don't forget that you can click the pictures to enlarge them. They're huge. You can see more detail that way. And my Superglasses that arrived yesterday. I love them. I want them all now. 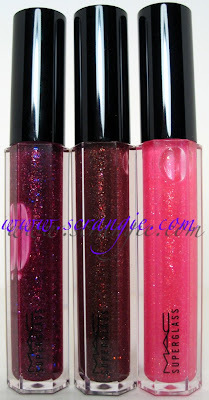 This is Fab Frenzy, Tunnel of Love and Superflash. I've only worn Fab Frenzy so far and that one looks great on me. Ahhhhhh so cool! Look at the little blue flashes of glitter in there!! I want that VV collection so badly! Those VV pics are EXCITING! OMG on Catch me in your Net! China Glaze Swing Baby WILL BE MINE! MUWAHAHAHAHAHA! wow hope to see the swatches soon!!!!! As frosts go, I think China Glaze makes them best...so I'm looking forward to seeing your swatches. The OPI's are intriguing, but it will take a LOT to convince me I should buy OPI. That lip gloss is gorgeous. Hope you'll share a swatch with us. Wow...the VV Collection is quite impressive in the pics. I couldn't really tell from the promo what the colors look liked. Exciting! I look forward to the swatches too! The vv collection looks great, not so interested in the opi, and already bought the 2nd Nicole. Thanks for the bottle pics! I have fab Frenzy--its GLORIOUS!! I'm so excited you will be swatching this VV collection-especially curious about that camel and greige with microgitter! I'm truly happy you are posting. YOU ARE STELLAR SWATCHER! Oooh Superglass. 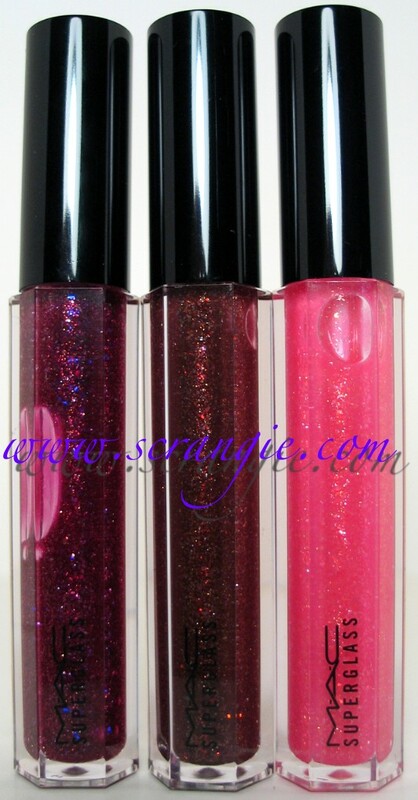 Would love to see swatches of your lips with these on. Thanks, Scrangie! I'm not too sure about the mini OPI collex, but the cooler colors of the China Glaze Vintage Vixen set are right up my alley. And I'm none too excited about the new Nicole set, since I'm only seeing them in the bottles. Maybe swatching them would change my mind about the Nicoles? Can't wait to see your VV swatches! The 2nd and 3rd Nicole colors look pretty much the same. Those are some beautiful colors, though. Scrangie, can you do the new OPI SoftShades 2010 Collection? The 4 pinks are so similar, I have a hard time choosing which one to get. Can't for the China Glaze swatches! They look interesting, and not like the frosties that I'd dreaded. The Nicoles look pretty sweet too. Can't wait for your swatches of Vintage Vixen! Please hurry. Wow those cool-toned China Glaze's are looking super-cool! Oh thanks, you give me a hope that VV is not frosty finish. I'm dying to see swatches of the China Glazes! They all look fantastic. WOW! Does anyone know when Flutter Collection will be available in shops? Camel and Ingrid are right up my alley - muuuuuuust haaaaaave. I'm in a separate boat. Even though I tried a bunch of Dazzleglasses, I never liked them as much as MAC's Lipgelees. And for this reason, I never even bothered to buy the Superglasses. They look AWESOME with all their glitter goodness, but I really don't like the brush-style wand. Much prefer the slanted tip with a tube you squeeze.